So I come home from work early three Friday’s ago (because I had to work on the Saturday afternoon) and my parents mentioned to me that a parcel arrived from Israel. As I was expecting my drop spindle from Galia’s Spindle Designs, who is located in Israel, this was very, very, very exciting. Needless to say I have been spinning like crazy since then. This is my first real handspun. It is from the Merino I picked up at the Gateway Fibreworks. It is only 10ish grams and is a DKish weight. I find the colors remind me of a good friend from University. Jessie, who I associated with turquoise and canoeing, was the victim of some of my early knitting adventures. It is in her honor that I spin this first yarn. I have the remainder of the 2oz of merino and I am making 3 singles, I am not quite sure how I am going to ply it, but I still have a final single to spin. After last post I was feeling swamped by all my WIPs. As of today, I have none. I finished Annie’s Mitts last Sunday, the 12th. I was somewhat dreading making them, but they were not a big deal. I forgot how much fun mitten making can be. Notes: I actually got gauge, and so these should be just about the right size. 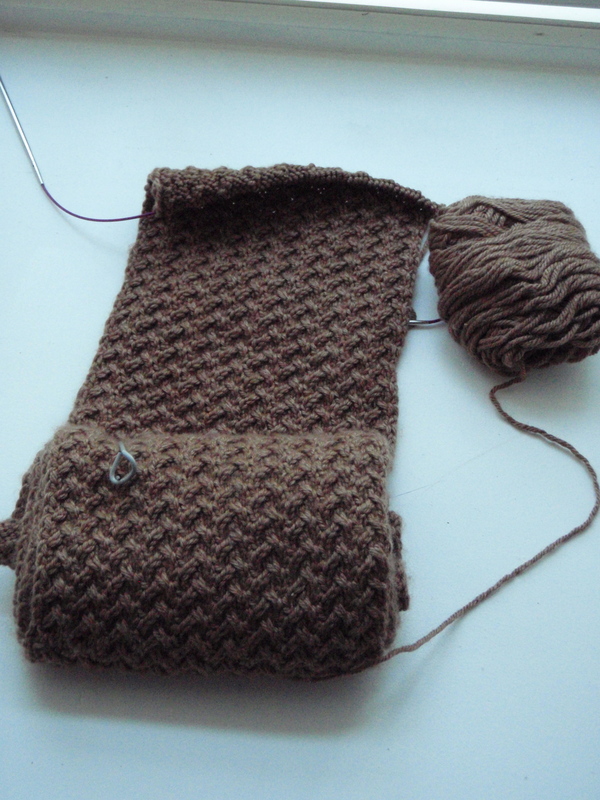 I also managed to finish my Shifting Silt Scarf on Thursday, the 16th. Mods: Only 3/4 the length of the original. Note: I had originally planned it for myself, but I like shawls, cowls and wimples so much more than scarves. I thought it would suit my Grampa, who doesn’t like long scarves so I ended up only using 150g or 369 yds, so I have another 50g of the Knit Picks Gloss DK in Doe that I can use for a hat or something else. and finally I also got my Grannie-bel Shawl done as of this morning. Notes: It was a nice, fun pattern, it really benefits from the beautiful Malabrigo Lace Yarn. I found the bind-off was too tight and when I blocked it I didn’t get too pointy. I would most certainly make this pattern again. It was nice to be done so many of my gifts for the season, but now it is time to cast on that mystery test knit I have to have done and blocked by the 6th of October. So, with the cool weather and crazy rains yesterday made it feel like crafting weather. So here is a little check in on some of my projects. 1. 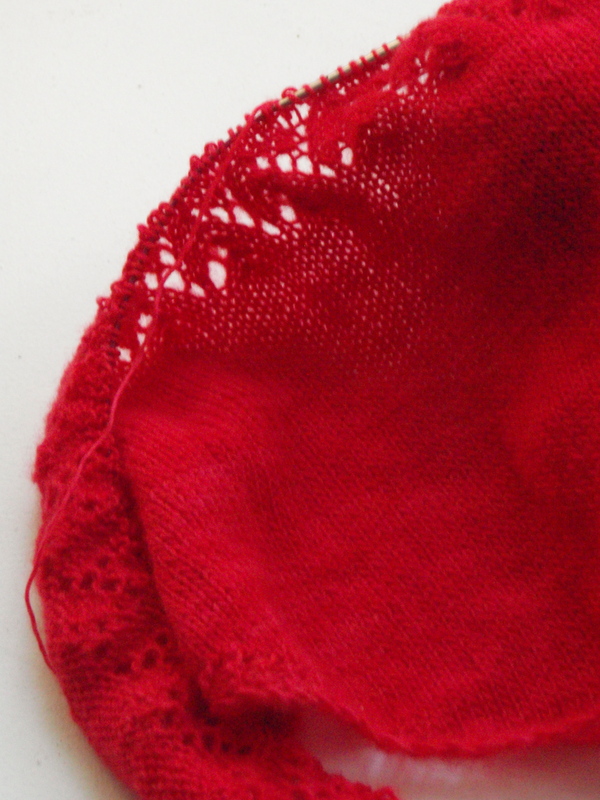 The Cherrywood Scarf (Jan 12, 2010 – July 24, 2010) has been reborn, as the Grannie-bel Shawl. My initial plan was to have this done for my Grannie’s 86th birthday on September 2nd. However, after making a mistake at the start of Chart B I scraped that and decided to make it her Christmas present. It is an Ishbel Shawl, designed by Ysolda Teague. This is my first time doing a Ysolda pattern and I am quite enjoying it. Malabrigo Baby Merino Lace is always a treat to work with, although having been reclamed from a project on 2.75mm needles and having had to back-knit a few spots has left it with a really attractive halo. That gentle halo, and the beautiful stitch definition I was able to get on the stockinette section has made this yarn the perfect choice for pattern. 2. Speaking of Christmas presents, I have quite a few of those between me and December 25th. I have the intention of knitting gifts for my grandparents (of which I only have two). For my Grannie, I have the Grannie-bel Shawl, and I am thinking about finishing my Shifting Silt Scarf for my Grampa. I had planned on making this for myself, but since I started it back in April I have discovered shawlettes, shawls, cowls and wimples as viable alternatives for my winter wear. So I want it to find a good home and I think the Knit Picks Gloss DK (70% Merino and 30% Silk) is just perfect for a winter in Parry Sound. I still have a ways to go on the scarf. I have yet to finish my third ball, so at least another 123 yds to go. In addition to my grandparents, I agreed to my Aunt’s request that I make hats for four of my boy cousins. My plan is to design a new top-down ribbed boy hat in a sport weight yarn. The new colors in the Knit Picks Andean Treasure were just perfect for my guys, they are getting hats in Reindeer Heather (Brown), Sapphire Heather (Blue), Mystery Heather (Black) and Embers Heather (Red). On top of that there is a wimple/cowl for my mother that I am making out of the local handspun I picked up in July, a pair of Bella’s Mittens in Knit Picks Swish Bulky for another cousin (I have 14 cousins in total) and in Malabrigo Chunky for my sister. My first pair of Bella’s mitts in the Mal Chunky turned out so small they only fit another cousin (seriously) with very, very small hands. The boy cousin hats and the Swish Bellas are “contract” work, while the others are genuine gifts. I am making terrible singles right now. 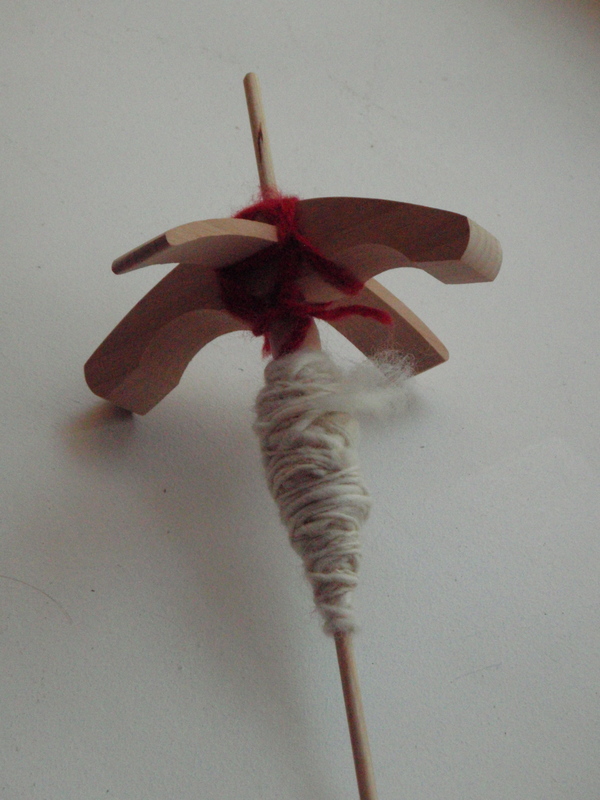 I got this Turkish Spindle and some rovings back in July from Knit Picks and I found that I prefer a top-whorl spindle, and that the KP spindle does not have very good balance. 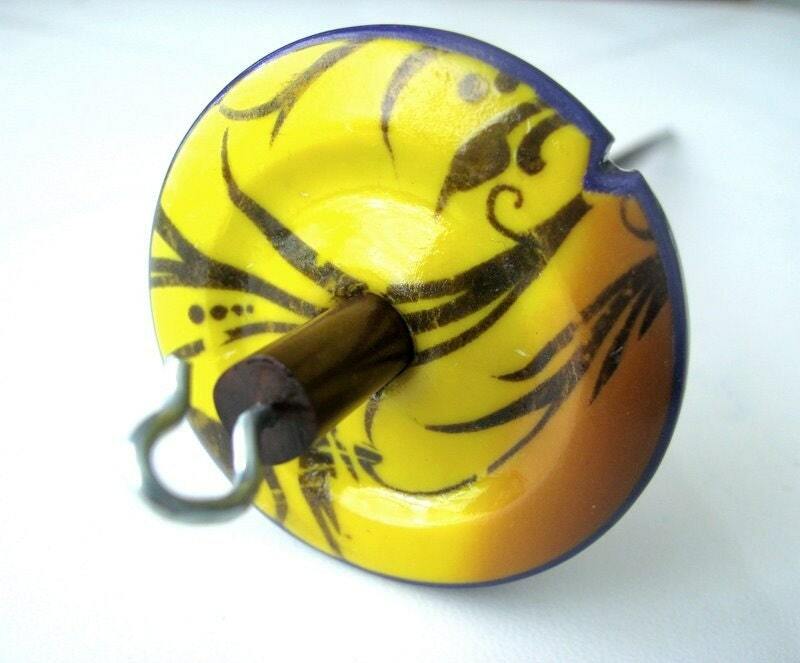 For that reason I have ordered a new top whorl from an artist in Israel, Galia’s Spindledesign. This is my new spindle, that is somewhere between there and here. Now, to enjoy this new spindle I happened to pick up some 100% Merino top from a local fibre mill I discovered this weekend. They were done with Wilton dyes, and the middle one, possibly my favorite, was made with only black dye. It reminds me of my 4th grade science fair project, which took a top prize, called “Is Black Ink Really Black?” which used capillary action to show the components of black ink. 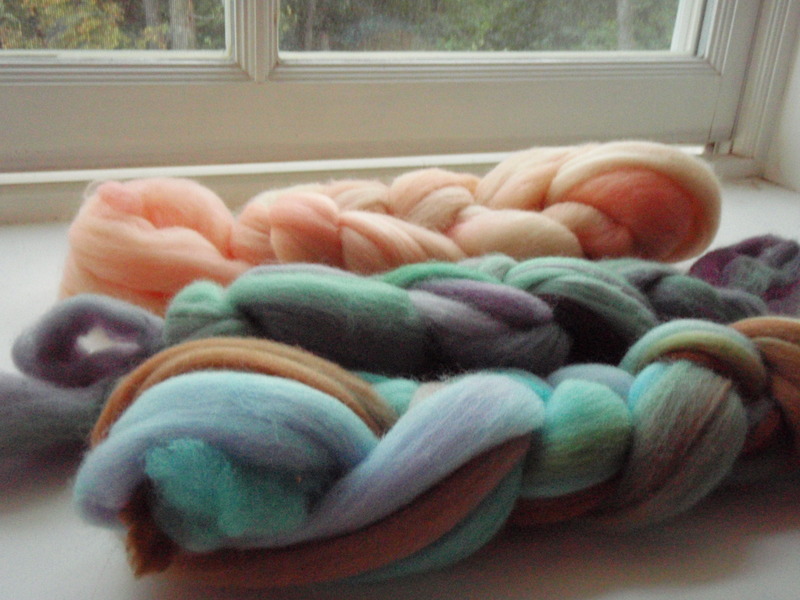 However, it is really nice fiber I am looking forward to spinning on my new spindle. 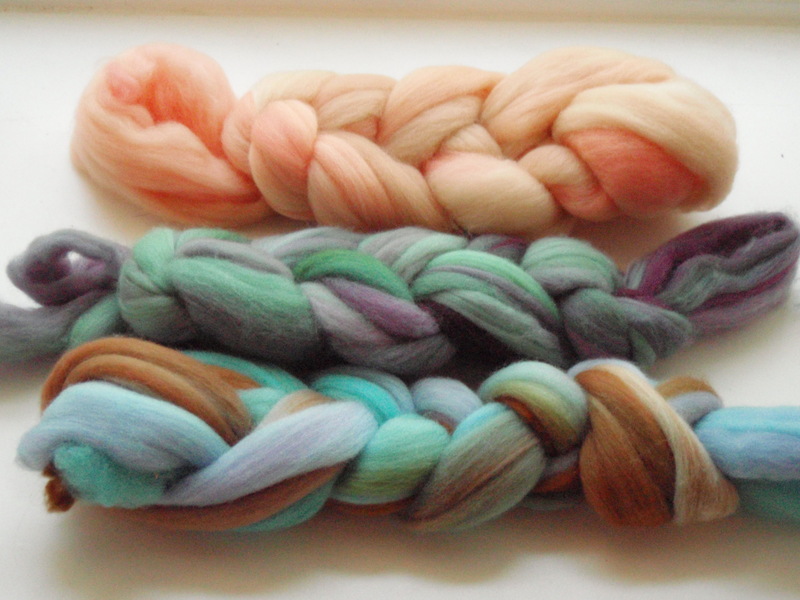 The Gateway Fibreworks in Gravenhurst, Ontario is totally awesome. They mostly work with Alpaca, but also have all sorts of books, finished items, beads, quilting supplies and felting supplies. Their green building is all kinds of awesome. If you find yourself in Muskoka please do yourself the favor of stopping in. 4. I have finished a few objects in the past week. One is my Meret. The Meret, turned out a little smaller and toque-ier than I had planned. 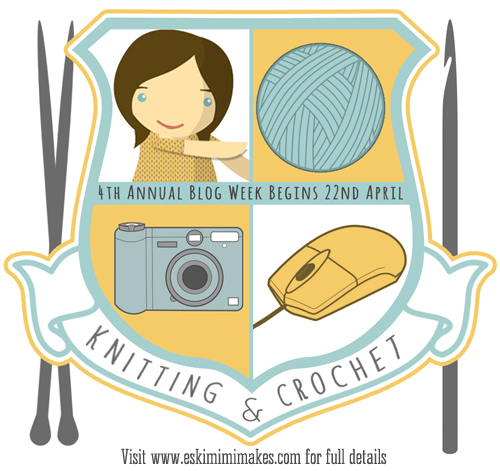 However, I need to remember that I may actually have to swatch on occasion (oh the horror!) and I should probably default to one needle size larger than everyone else. 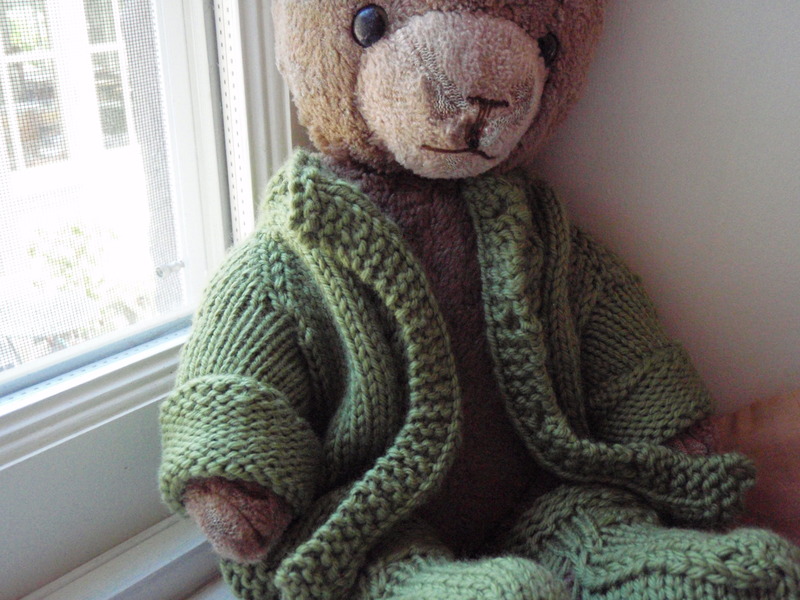 The model in this photo is my nameless bear, he is a product of a failed relationship, I love the darn thing so much I couldn’t get rid of him, rename him or use his original name. The other, which I am really proud of, is my Baby Mason Set. My bosses, who are married to each other, are expecting a baby in early October. Being the kindhearted person I am I decided that as a way to stash bust some Knit Picks Swish Worsted in Grass by making a baby cardigan and booties. 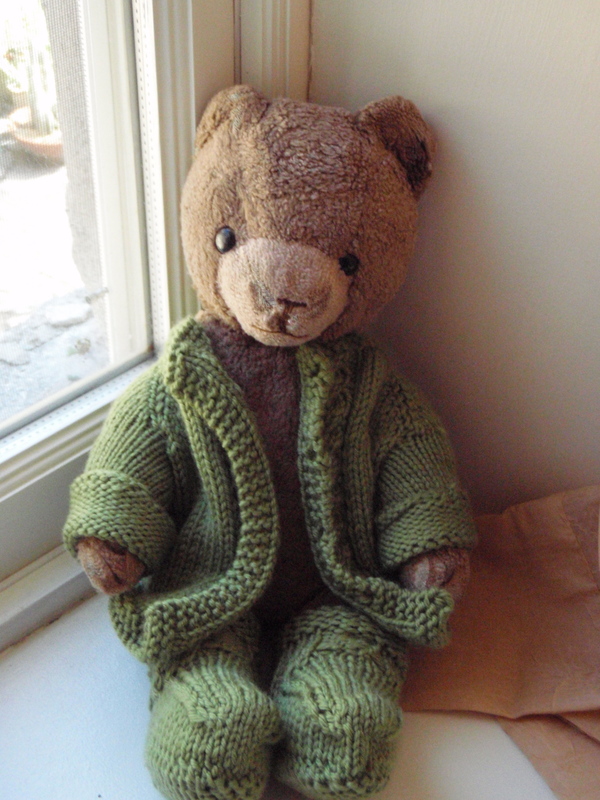 As I have no small humans to use as a model, my teddy bear Brownbear is doing his best to show off Our First Sweater and Our First Socks. 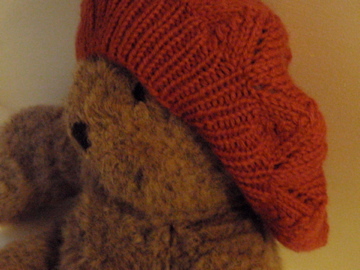 Brownbear has been mine since my first Christmas, and has been on nearly all of my adventures, and even a few of his own. If you ever catch him a few drinks in, he might tell you about the time he took the bus alone from Sudbury to Toronto and then back to Parry Sound. I would be lost with out him. 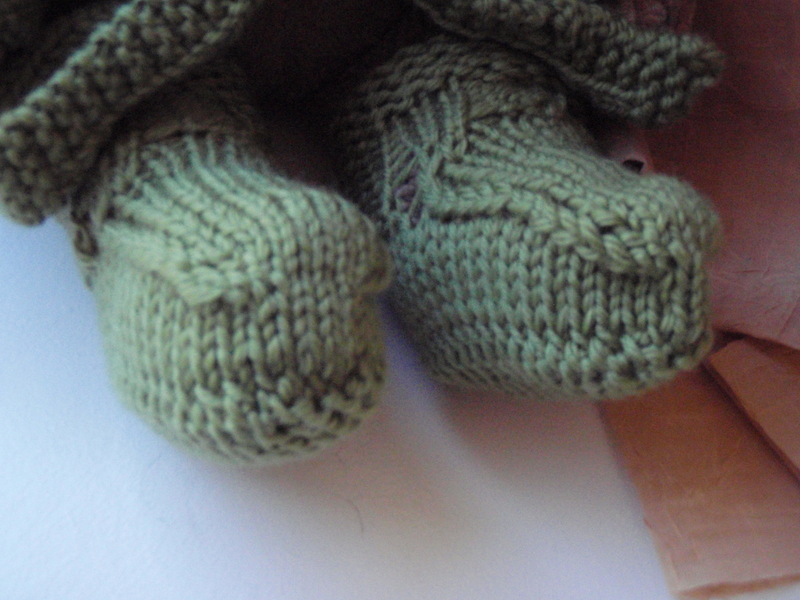 The names of these objects are deliberate as they are my first sweater and socks/booties. They are still missing some buttons and ribbon, but the Parry Sound Sewing Centre upholds the old tradition of being closed on Sundays. This, and the fact that it is Labor Day Weekend, means I will not be totally done with this project until Tuesday. However, these were fun, quick knits. I expect to have more babies appear in my life (but not from my body) in the next couple of years I am trying out patterns to figure out my default baby gift. So, I have had a busy week and I am currently trying to reskein some of my stash that has been caked for too long. 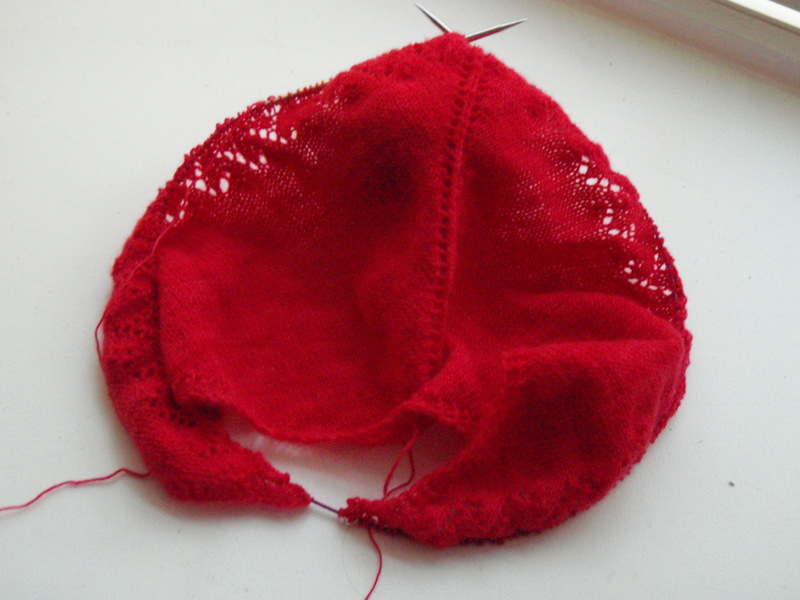 I find winding onto a niddy-noddy to be very soothing activity. So I have more than a few projects ahead of me, but it sure a good feeling to have a few behind me!